It was billed as “the world’s first ever 3D broadcast of live sport”. Nine pubs across the UK and Ireland kitted out with a special 3D television from LG, and with a mouthwatering clash between Arsenal and Manchester United to provide the excitement. The location of the pubs was a closely guarded secret with Apple-like clandestineness and attention to detail. Even the power of Twitter and a concerted effort by many to find them was not enough. In the end only a few choice journalists and friends of the pubs in question got to see what was billed as a historic broadcast to the public. There’s a history of this in TV going right back to the earliest demonstrations of TV itself, but what is unequivocally wrong (and an outright lie) is Sky’s claim that it was the world’s first ever 3D broadcast of live sport. I could write an entire blog post on previous live 3D sports broadcasts, but that’s probably not why you’re here. 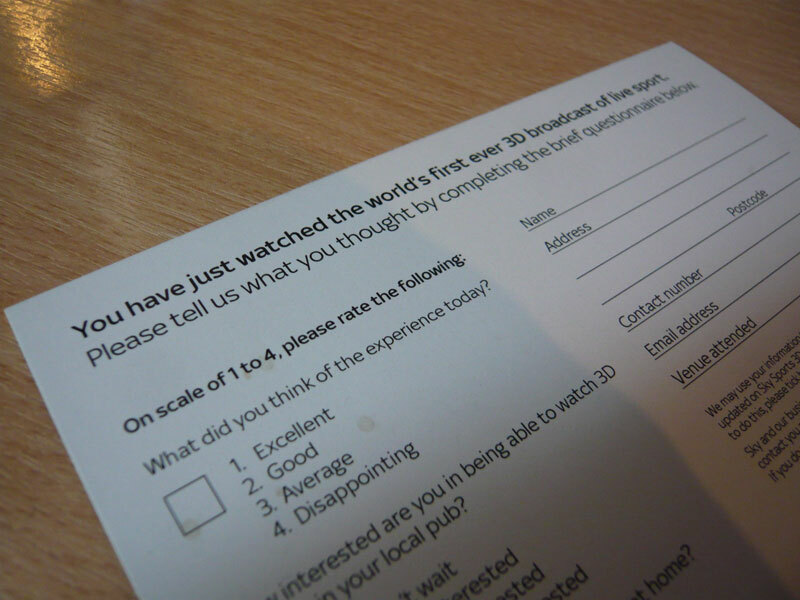 They could have used phrases like “The world’s first live 3D football broadcast”…. 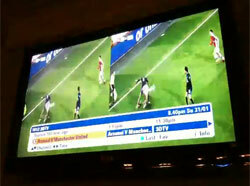 “the UK’s first live 3D sports broadcast”… “The world’s first live 3D sports broadcast to a TV set“…. all would have been ok. But in their press release they even had the gall to suggest that they were the “first UK broadcaster to demonstrate 3D through a domestic TV”. In fact, experimental 3D TV broadcasts go back as far as the 50s. Suffice to say Sky’s marketing department is enthusiastic at best. With that beef off my chest, I can tell you about the broadcast itself and the motivations and technology behind it. For many people this sudden renewed interest in 3D television is annoying. “You mean that brand new HDTV we just bought for thousands of pounds is going to be obsolete?” Er, yes. And that’s precisely the reason why 3D is being pushed hard right now. James Cameron’s Avatar was a godsend to the TV business. It handed a catalyst in consumer interest on a plate. The industry could have introduced UltraHD as the next must-have upgrade, but they rightly figured it would be a tough sell to us. 3D therefore is the perfect ‘in-between’ technology to force us to buy a new TV in the interim while UltraHD will come later. While Sky do not make TV’s, they do have very cosy relationships with the TV makers and stand to make a lot of money in bolt-on 3D subscriptions. As Sky approaches 10 million subscribers in the UK and with 2 million HD subscribers, anything that can get their £500 a year average revenue per subscriber moving northwards, means continued joy for their shareholders, and financial pain for the rest of us. They have said that 3D TV will be a free add-on for their top-level subscribers initially, but we all know where that’s heading. Long term it’s going to cost us more to have 3D. Another big motivation for Sky was stealing a march on the competition. Press releases went out from mobile provider O2 on January 12th for a live 3D broadcast of the Six Nations rugby tournament taking place February 6th. That was billed as “the first time a sports event has been broadcast live in 3D in the UK”. Aside from the fact this shows O2’s marketing dept. clearly has better scruples than Sky in the facts arena, it shows that Sky were not going to let someone else steal their 3D thunder, and possibly, that the Arsenal / Manchester Utd broadcast was a hastily organized reaction to the Six Nations event. I don’t know if this is true, but Sky’s press release went out on January 28th, so they had 16 days to bring their 3D plans forward if so. 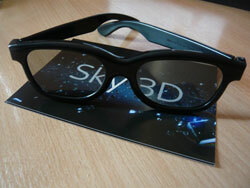 The technology that Sky is using for their 3D broadcasts is based on polarized glasses. This is an improvement on the red / green style ‘anaglyph’ glasses we’re more familiar with, as they allow full colour imagery. The downside is that a special playback device (the TV) is needed. This is very similar technology to that used in the IMAX cinemas. For techies, Sky is broadcasting the 3D signal over their existing satellite infrastructure to their existing HD boxes. They do this by ‘squishing’ each of the two video signals (left & right) into a single, combined, ‘side-by-side’ video signal which the 3D TV can then stretch back again. I recorded a video of this process during a glitch in the broadcast. The majority of a football broadcast is a wide-angle shot from the centre of the stand. Wide angle shots of a subject hundreds of feet away has no 3D depth. It’s flat effectively. So this shot appears almost 2D and its the main shot you see, most of the time. Many observers said that the ‘low angle’ shots looked the best and they did. But it had nothing to do with the shot being low-angle particularly. It was simply that low angle shots in football typically have lots of depth-of-field, with characters in the foreground, mid-ground, background etc. This is where 3D shines. Other sports like Tennis, Golf, Boxing and Athletics look much better in 3D than stadium sports like Football. We got to see some examples of this during half-time. For some sports (eg Table Tennis), 3D may well be the thing to change their TV fortunes. The 3D effect was good and pronounced. Not as good as Avatar, but that’s not surprising. The screen is much smaller in your field of view and the producers didn’t have 15 years to make it work. I noticed some ‘blurriness’ (3D mis-alignment) in the bottom left of the screen, as did my friend, but I’m not sure if this was the TV set itself, the glasses, or on the production side. Colours were vibrant and the resolution very sharp. Made out of the heaviest plastic known to man, these attention-grabbing fashion beauties were heavy on the bridge of the nose and uncomfortable. Not being someone who wears glasses particularly, I found the thick frames and small lenses (compared to say the IMAX goggles) distracting in my field of view. Curiously the IMAX glasses which are also polarized did not work with the Sky broadcast. A different kind of polarization I guess. Sky had 8 cameras, 3D graphics and no steadicam. A steadicam would be great for the touchline shots in 3D but for that they’ll have to a) find someone beefy enough to handle the weight or b) get the weight down considerably. The permanent on-screen graphics (score and time) were too far forward in the 3D depth (Z-index), and thus distracting and annoying. The 3D animations for the action replays were similarly OTT and annoying. The pre-game graphics were much better. It’s tough enough to produce a 2D live broadcast of a major sporting event, 3D adds a whole new dimension (sorry). I found the choice of shots to be almost exactly the same as a 2D football broadcast and this does not make the best out of the medium. This will surely improve as the technical directors and cameramen get more familiar with it. Some of the camera guys clearly knew what they were doing, and there was one shot from behind the crowd where the camera person tracked some people walking to their seats with the pitch behind them. This showed me that the camera operator was thinking about 3D depth in selecting the shot. In summary it was a decent first attempt, but not outstanding, and things will get much better over time. There was a time where adding sound to movies was a ‘whole new dimension’ and it took a long time for the production crews then to work out what they could do with that. One thought occurs to me and that is that having to wear glasses to watch a screen a few feet away will seem twee in 20 years. If we’re wearing glasses we may as well be wearing fully immersive ‘VR’ glasses that fill our field of vision and allow 360 degree viewing. Now that will be something to get really excited about. I think it’s a good step forward and kudos to the production staff at Sky for pushing the boundaries and pulling off the broadcast. I just wish their marketing dept. could have been more honest and I’d probably be much more complementary. I wanna try one…Great post…love the info..Thanks for sharing..
Great article. I am looking forward to when 3D technology is more readily available. Here is an article about the technological advances that are being made by Canon that is making that availability come sooner rather than later.